My TacLite pants arrived, and they are fabu. Which is probably the first and only time someone has called police-grade pants “fabu”. I am especially pleased that they fit. Technically my legs are 31″ — an odd size that pants are never made in (men’s lengths come in 30″ or 32″) so I took a risk on 32″ and fortunately they’re not too long. The waist sits much higher than jeans, but that’s ok. They look like cargo pants. I suspect they are not warm in winter, so will add long underwear to my list of items I need in a go-bag. My CamelBak also arrived today, and it is smaller than I expected, but I suppose that is good since realistically, my back is not very long anyway so this will actually fit. The desert-camo pattern is nice. 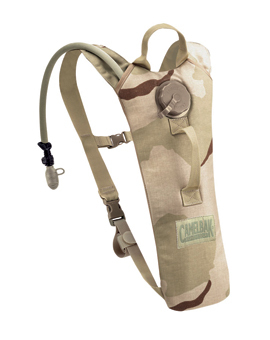 I am so glad I went with the military version of CamelBak rather than the consumer version. The lack of unnecessary pockets and frills is very nice and clean. Subscribe to comments with RSS or TrackBack to 'Gear has started to arrive'. Are you hiking? Holy crap! What did I miss. I must read further.